Magnets are packed with space between the magnets and the outside of the box. Can I ship magnets by via air? Can I just stick them in an envelope? Learn more about shipping powerful neodymium magnets. Practical Considerations - Give 'em Space! First and foremost, magnets need to be packaged so that they don't get stuck to steel objects. This means keeping magnets far enough away from the edges of the box so that they can't attract to anything outside the box. We haven't found any good regulations or standards concerning this. The comical picture we often imagine is an envelope full of magnets stuck to the side of the UPS truck. They never get to their destination because they're stuck to the side of the truck! In reality, it's the sorting equipment that may cause problems. Steel rollers, walls, etc. can pose a problem if the magnetic field extends outside your package with too much strength. This is true whether you are shipping via air or ground. Make sure the magnets have ample space around the magnet to that there isn't much attraction force outside the box. A magnet's attractive strength drops very quickly with distance, so this usually isn't too hard. View the Force vs. Distance curves under the "Technical" tab on any of our product pages for more details. For example, a DX0X0 1" diameter x 1" tall cylinder has a Force to a steel plate vs. Distance curve like this. We don't recommend shipping neodymium magnets in a plain envelope. Even small ones can reach through the thin paper walls. If it sticks to your refrigerator door, it's probably not a good idea to mail it. There are two important measurements of a package containing magnets. Rule #1: If the field strength is 2 milligauss (0.002 gauss) or more at a distance of 7 feet from the package, the IATA (International Air Transport Association) says the package needs to be labeled as Magnetic. This is especially applicable for international shipments. Magnets are often shipped in a steel-lined box to remain below this limit. If there is any chance that the arrangement of magnets could change, or any package shielding could be damaged so that a measurement exceeds this value, it falls under the Dangerous Goods category and should be labeled as Magnetic. Rule #2: For any package shipped by air, whether it is labeled magnetic or not, the field strength must be 5.25 milligauss or less at a distance of 15 feet from the surface of the package (FAA Title 49, Part 173.21 Forbidden materials and packages). If the package measures above this value, don't ship it by air. Why are these rules so important? The magnetic compass. Despite all the fancy GPS navigation systems, the basic compass is still an important part of aircraft navigation. If a cargo of magnets alters the compass readings, accurate navigation might be compromised. Remember, your magnets are competing with the magnetic field of the Earth, whose strength is only about 0.5 gauss on average. A sensitive magnetometer can be used to determine the field strength at these distances. We like the Air Shipment Milligauss Meter from Trifield.com. When in doubt, measure your package with this sort of instrument. Are there any guidelines for estimating field strength without such a measurement device? We can offer a few guidelines, though you would need to measure your actual shipment to be 100% certain. Our Magnet Calculator provides the field strength of a magnet along the axis of a disc, cylinder or block magnet. At distances of 7 or 15 feet (84 or 180 inches), this is typically the highest value you would be able to measure if you had the right meter. The calculator provides the theoretical field strength for a single magnet in free space. You can use the calculator's theoretical values for field strength for disc, cylinder or block magnets as a guideline. For example, if you are concerned about shipping a 1" cube magnet like our BX0X0X0, you can enter the size into the calculator and calculate the field strength at 84" and 180". Plugging in the numbers, we find the calculated field strength is 3.5 and 0.4 milligauss for 84" and 180", respectively. Since the strength is over 2 milligauss at 7 feet, a single BX0X0X0 magnet might require labeling as magnetic material for international air shipment. Since it is below 5.25 milligauss at 15 feet, it can legally ship via air. You can use a compass to make rough measurements of the field strength outside your package. We conducted a number of measurements with a few of our larger magnet sizes to come up with a good gauge. For Rule #1: When a magnet is stronger than 2 milligauss measured at 7 feet, we found that a compass will deflect about 15 degrees at a distance of roughly 32 inches from the magnet. 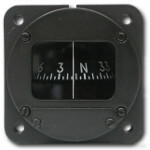 If your compass deflects this much at this distance, it may be classified as a magnetic dangerous good for air shipment. For Rule #2: When a magnet is stronger than 5.25 milligauss measured at 15 feet, a compass will deflect about 15 degrees at a distance of 7 feet from the magnet. 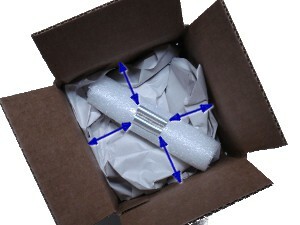 If your compass deflects anywhere near 15 degrees at 7 feet from your package, don't ship it by air. Consider shielding the box by lining it with steel sheet-metal. Be sure to keep away from any steel structure when making these magnetic measurements, whether using a Milligauss Meter or a simple compass. Do you have a smart-phone? The iPhone and Android phones have compass applications you can use instead. We tried a few here, and they worked well as a substitute. Multiple magnets can significantly alter the measured field strength. 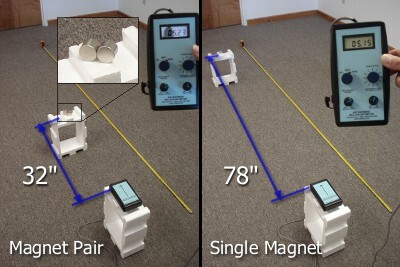 Two measurement scenarios of DX8X0 magnets. On the left, a pair is oriented side by side with the north poles facing in opposite directions. On the right, a single DX8X0 is measured. At the distance shown, the field strength is about 5.25 milligauss. In both cases, the field strength is less than 5.25 milligauss at 15 feet (180"), so these magnets can be shipped by air. Of course, most shipments aren't just a single magnet in free space. Other magnets placed nearby can make big changes to the magnetic field. When we ship multiple magnets, they are often arranged in alternating stacks, with the polarity of each stack facing in opposite directions. Not only do they attract together and stack nicer this way, it also reduces the field strength at a distance by a huge amount. Yes, two stacks of magnets next to each other with opposite polarity can often have less field strength at a distance than a single magnet! See the picture at right for a good example of this. A single DX8X0 magnet reaches 5.25 milligauss from 78 inches away. A pair arranged side by side with the north poles facing opposite directions has a much weaker magnetic field around it. You have to get within about 32" to reach that same 5.25 milligauss level. Generally, other magnets or ferromagnetic objects in your shipment will reduce the measured field strength at a given distance. If your magnet is stuck to a steel surface, or otherwise surrounded by steel or other ferromagnetic materials, your measured field strength will probably be lower. See our article on Shielding Materials for more information about shielding neodymium magnets.